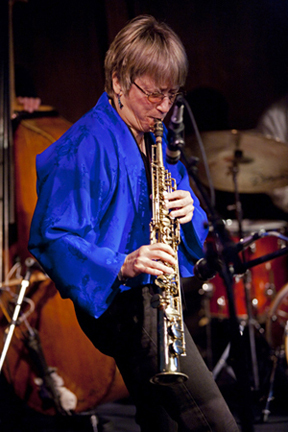 Few musicians have imbued the soprano sax with such a unique voice. You could say motion is Jane Ira Bloom’s muse. For four decades, the soprano saxophonist/ composer has been delving into the suggestive links between physical movement, perception, sound, and art. When I first saw her perform in the 1980s, she was already fascinated by Doppler effects and plugged into electronics. Now as then, I’ve watched her body and horn sway, pivot, jab, and swoop, projecting single-horn soundscapes haloed by delay, reverb and the like; when she clicks on a foot pedal, out jump multiple soprano saxes. It can make you wonder what might have happened if Jimi Hendrix had taken up the soprano sax. After all, Hendrix’s sonic pioneering was also inspired by motion—in his case, the shearing sounds of the wind and psychedelic Doppler effects he first encountered and reveled in as an Army paratrooper. It’s easy enough to imagine that Hendrix, the cosmic bluesman, would have empathized with Bloom’s creative obsession with movement, and been happily astounded that she has an asteroid named after her. With motion as her muse, it’s no surprise that Bloom frequently composes works for dancers, including the Pilobolus and Paradigm companies. Her albums can sport concepts and titles like Wingwalker, where gyring lines and eccentric rhythms, empathetic compositions, and seamless improvisations recreate the decentered sensations of barnstormers doing acrobatic stunts on airplane wings in flight. Always on the lookout for multidisciplinary projects, she collaborated with noted lighting designer James F. Ingalls on Unexpected Light,” a (sadly) one-off performance where they improvised a multimedia work in real time. A CMA/Doris Duke New Jazz Works grant helped create Chasing Paint, a series of compositions inspired by Jackson Pollock that premiered at Houston’s Museum of Fine Arts. And sometimes Bloom boldly goes into where no one has gone before. 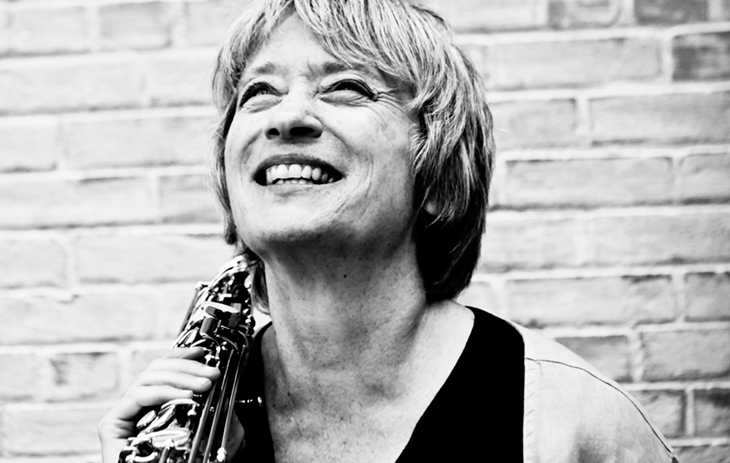 In 1989, she became the first musician to spend a year in residence at NASA’s Art Program, and composed works for unusual instrumental and electronic lineups with titles like “Most Distant Galaxy.” The American Composers Orchestra commissioned “Einstein’s Red/ Blue Universe.” A few years later, minor planet 6083 was named Janeirabloom. Aside from two mid-tempo tunes, the tracks are ballads—a daring challenge, even for a musician who is one of the prime balladeers of her, or any, generation. Pianist Dominic Fallacaro, bassist Cameron Brown, and drummer Matt Wilson, recurrent Bloom collaborators, spin and stretch time and tonality and emotion on classic ballads and four Bloom originals. In the process, they translate Allen’s outer-space experience into music that moves with subtlety and coiled intensity. On Kurt Weill’s “My Ship,” she aimed her horn’s bell under the piano hood to resonate its strings, yielding a gentle sympathetic haze. For “Good Morning Heartache,” one of the ballads here that Billie Holiday put her stamp on, Bloom’s soprano infuses bluesy bends, scruffy intonation, and bitten-off notes into her liquidgold sound. The piano-sax intro to “The Way You Look Tonight” seduces you as it takes its deliberate time tenderly unfolding love’s transformative magic. Thirty years ago, I wrote, “Bloom has one of the most gorgeous tones and hauntingly lyrical ballad conceptions of any soprano saxophonist.” Sixteen Sunsets underlines how true that still is. The album was recorded in what Bloom and engineer Jim Anderson call “Sound Surround.” In the studio, microphones ringed the performers, snatching everything that happened from almost every direction. “When you listen to it,” Bloom declares happily, “it sounds just like you’re standing inside the band.” Which is pretty much where she’s always wanted to be. At Yale in the early 1970s, Bloom met up with a cadre of ambitious contemporaries, now dubbed the New Haven Renaissance. Like her, they were probing the edges of contemporary jazz and classical music: among them were bassists Mark Dresser and Mark Helias, with whom she’s regularly joined forces. Moving down to the Big Apple, these Elis gradually coalesced into a small scene with other artistic adventurers their age, like John Zorn, Wayne Horvitz, Bill Frisell, and Marty Ehrlich. As they scrambled for places to play, many of them weaving in and out of each other’s ensembles, they became the recombinant DNA generating many strands of what became known as the “downtown” sound. The tag was misleading and reductive, but it put them— and the Knitting Factory’s first grungy Houston Street storefront—on the map of music history. Back in those days, Bloom still periodically packed her alto to gigs. But as her focus on motion developed, the soprano became her sole voice. “It has no bell,” she explains, “so the sound goes out everywhere, in different directions.” And can be deftly shaped into dazzling effects, if you happen to be a virtuoso at using movement to alter sound. In the history of jazz, only a handful of players—Sidney Bechet, John Coltrane, Steve Lacy, Dave Liebman—have imbued the soprano sax with a unique voice. Bloom’s achievement lengthens a very short list. One of the cyclical mini-surges of interest American major labels show in jazz rolled around in the late 1980s and early 1990s. Bloom was among its beneficiaries; Columbia put out two strikingly different albums, Modern Drama and … wait for it … Slalom. When that major-label wavelet inevitably ebbed away, she notched up four more albums for Arabesque. This American indie was originally a classical label, but in 1992 switched to jazz to catch what looked like one of jazz’s periodic bumps into broader markets. Arabesque artists generally melded jazz with elements of every musical genre, from classical to rock to world music. That broadly describes what Bloom, in very much her own ways as always, was up to on discs like Art and Aviation, The Red Quartets, and Chasing Paint: Jane Ira Bloom Meets Jackson Pollock. Bloom’s avid multidisciplinary curiosity has taken her into some fascinating places. At the now-defunct Philoctetes Center for the Multidisciplinary Study of Imagination, she curated a performance-and-discussion series that featured choreographer Carmen de Lavallade, neuroscientist Josh McDermott, Arabic music scholar Toufiq Ben Amor, and a couple of her working bands. Thanks to the wonders of modern technology, you can watch these sessions on YouTube. So when she says that Emily Dickinson is her next project’s inspiration, you just want to slap your forehead and say, “D’oh!” “There are her sprung rhythms, her sense of surprise, her intense feelings,” Bloom enthuses. “But I also found out she improvised on piano. Think about that!” A famous Dickinson line runs, “Forever is composed of nows.” That speaks to any improvising artist, who has to be in-the-moment, and perhaps especially to Bloom’s creative grasp of space, time, and motion. It will be fascinating to hear their two rare minds meet. Gene Santoro has written a biography of Charles Mingus, Myself When I Am Real (Oxford University Press, 2001) and Highway 61 Revisited (Oxford 2004), about American music’s complex roots. His next project recounts his bout with Guillain- Barré Syndrome.